Habitat: Freshwater lake with extensive reedbed; deciduous woodland along margin. 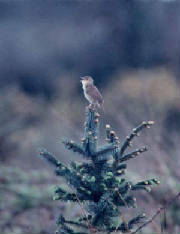 Main interest: Winter waterfowl; breeding & passage warblers. Typical birds: Great Crested Grebe (has bred), Whooper Swan, Pochard, Goldeneye, Water Rail, breeding & passage Sedge & Reed Warbler, Redpoll, Reed Bunting. Scarcer species & rarities: Red-throated Diver, Little Egret, Gadwall, Scaup, Ruddy Duck, Scaup, Long-tailed Duck, Marsh Harrier, Green Sandpiper, Little Gull, Ring-billed Gull, Black Tern. Conveniently located beside the main Waterford-Dunmore road (see Dunmore East for access details), Belle Lake is always worth at least a quick look on the way to or from Dunmore East or other coastal sites. 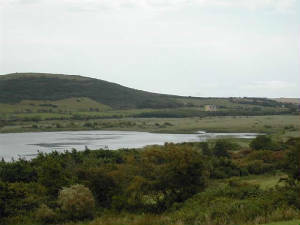 This is the largest natural lake in Waterford, and more regularly holds Goldeneye than the other lakes. Other diving ducks also occur, sometimes in good numbers but scarce in other winters. Teal and Mallard are fairly regular, but may be hidden in the reeds which border the west and south margins of the lake. Great Crested Grebes occur occasionally, and bred here in 1979-80. Mute Swans are resident throughout the year (and breed), and Whooper Swans occasionally fly in to the lake in winter. However, the flock of Whoopers that occurred in the fields to the west or south of the lake during the 1980s and 1990s are nowadays generally absent. The reedbed at the south side of the lake is the largest in east Waterford, and holds good numbers of breeding Sedge Warblers and Reed Buntings. 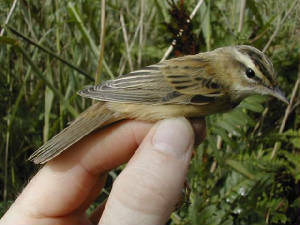 Grasshopper Warblers also breed, in rough ground bordering the south end of the reedbed, and Chiffchaffs, Willow Warblers and Redpolls are prominent in summer. Water Rails winter and breed in the reedbed. 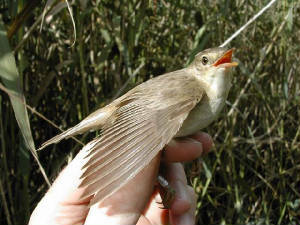 The reedbed nowadays holds a small breeding population of Reed Warblers, a recent colonist in Co Waterford, and the species also occurs on passage here. Belle Lake wood, bordering the roadside at the north-east end of the lake, is worth a listen in spring and autumn, as Stock Dove, Treecreeper, Blackcap and Chiffchaff all breed, and there is a good-sized Rookery here.